In 2010, when I started this blog, I had no idea it was going to lead to this. But today, I'm proud to release a book into the world called Backdoor Revolution-The Definitive Guide to ADU Development. It has taken me 2.5 years to write-a labor of love. The trajectory of this ADU book began with this lowly blog. This blog translated into a class. That class eventually made me realize there was a need for other homeowners who weren't in Portland, to be able to accces information about how to develop an ADU. 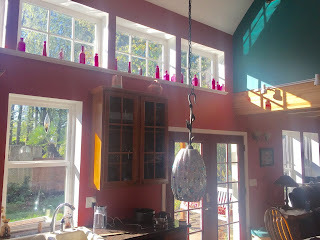 Then, in editing AccessoryDwellings.org, which I started with two other ADU afficianados in 2012, I began to pay attention to the bigger ADU trends, or lack thereof, outside of just a small handful of cities in the country. I witnessed city after city floundering in its regulatory attempts to foster ADUs. I knew what they were doing wrong, but who was I to tell them so. Eventually, seeing this pattern of failure made me fed up. That's when I knew it was time to write a book. This book is an attempt to help those who want to help themselves. It is not an attempt to convince others of the merits of ADUs. It is an attempt to help those who are already convinced of the merits of ADUs, to actually build one. It is simultaneously an attempt to help cities who are hitting their heads against the wall with futile effort to induce more ADUs. It is not an attempt to convince cities that they should foster ADUs. Rather, it is an attempt to help cities and ADU advocates to accomplish their aspirations of fostering more ADUs. If this describes you, you will get great value from reading this book. You can buy the ADU book here. 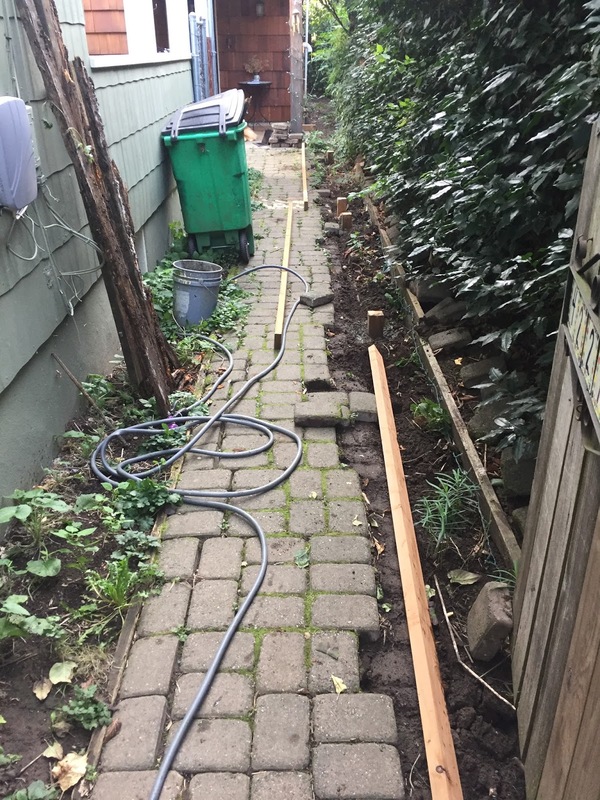 Maybe I should have incorporated landscaping into my initial ADU development process after all. Because it's now been six years since I finished the ADU, and I've just now gotten around to landscaping it in 2017. It took six years, but I'm finally spending a lot of time in the back yard this summer, and I love finally having a garden that we can enjoy. Once we had removed a large dying Cherry tree from the yard last year because, it opened up the opportunity for a much more sunlight to penetrate the yard than it ever had before. The cedar fence that separated my property from my neighbors was old and rotting and desperately needed to be replaced. Lastly, I wanted to plant a new tree and the time seemed right to overhaul the landscape of the entire property. 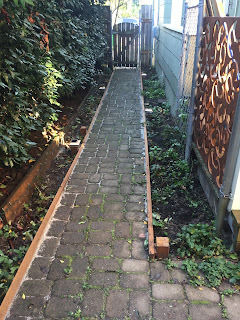 So, I bit the bullet, and hired a garden designer who helped guide me through that process. I managed to do all the work for roughly $8K out of pocket, plus approximately $3K in sweat equity. The job required a surprising amount of work: probably 250-300 hours total. I did roughly 80 hours of work over a 2-week period, and hired help for much of it. First, we removed the existing rotting fence, and built a new 80ft cedar fence ($2K). 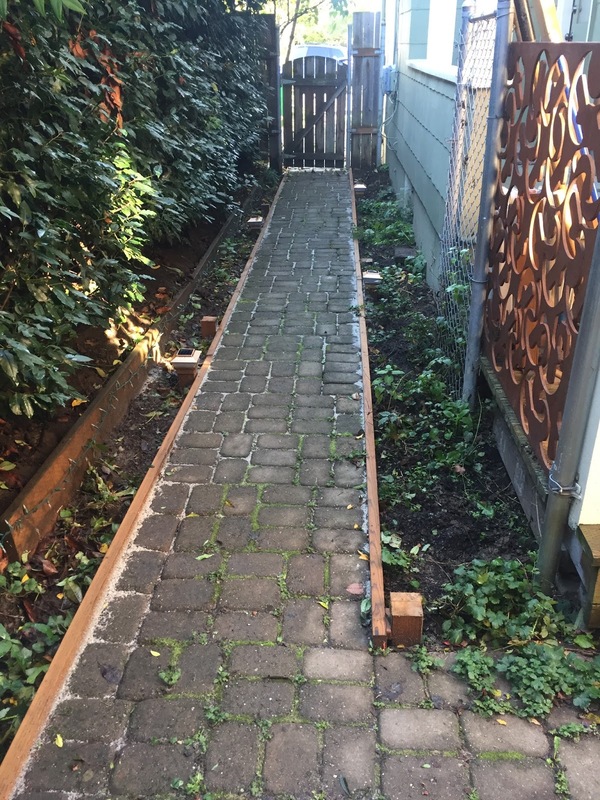 For landscaping, the first stage was to remediate the yard material which involved removing a lot of dirt that had weeds in it. Weed barrier was then laid down, and about 6 cubic yards of new soil was imported to shape a slight berm where the plants would go along the fence ($3K). The lawn size was reduced, then gravel was imported and spread out on top of more weed barrier. Then, we greatly expanded the footprint of a modest stone patio and created a walkway between the ADU and the main house ($1K). The garden designer purchased $2K of new plants, groundcovers, shrubs, perennials, ferns, and potted plants and we meticulously planted them in the berms. Lastly, cedar mulch was spread out on top of the soil between the plants. Here's a short photo album of the landscaping process. I've never had a green thumb, so I relied on the designer's solid vision of how the garden's plants would evolve over time---how much they would grow in height and how their colors would intermingle and compliment one another. The garden designer was very studious about the light conditions, and clued in to which plants would thrive and where. While the plants are currently spaced 2-3ft apart, they'll eventually grow in to varied heights, and be lush, colorful, and flower at different points throughout the year. I'm watering the plants daily and it's thrilling to see how they are instantly thriving in this new fertile sun-rich environment. In other ADU news, I've just purchased an investment property in my neighborhood. This is what it looks like now; I've got my work cut out for me. Whereas this blog (pdxadu.blogspot.com) has focused on the development of a detached new construction ADU as our primary residence, this new project is going to be focused on the conversion of a daylit basement ADU as an investment property. It's a very different type of ADU project than my first one, and I'm expecting to learn a lot in the process and I invite you to come along for the ride. 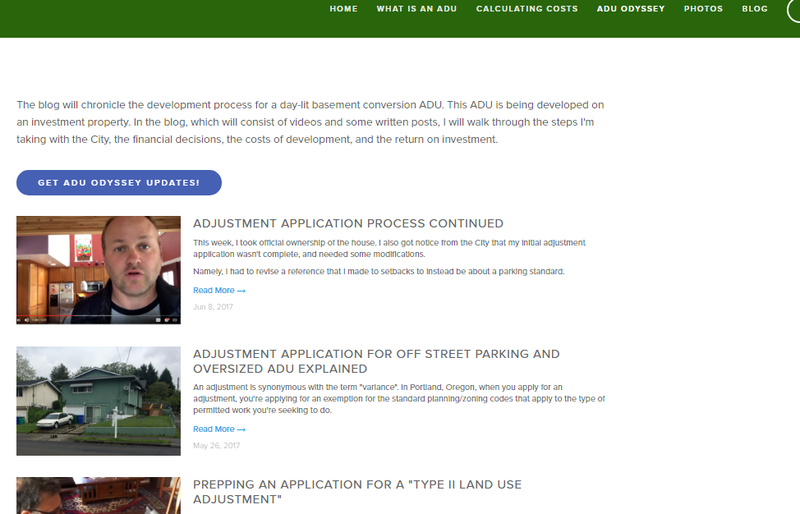 As with my first ADU, I'll be cataloging the development decisions, as well as the costs and the permitting and regulatory process on a new ADU focused website called BuildinganADU.com. I'll be actively posting to the ADU Odyssey blog for at least the next six months on a regular basis. If you've enjoyed reading pdxadu.blogspot.com, you'll love digging through the new site which includes a trove of actionable information, tips, ADU images, ADU cost information, small space design best practices, and much more. The Cherry Tree that both plagued and complimented the backyard where we built our ADU, was starting to die. It was with mixed emotions that I hired an arborist to cut it down. On the one hand, I had explicitly bought this property and built the ADU partly because of the allure of having a large tree outside my bedroom window. On the other hand, after living in the ADU for several years now, I've come to realize that I wanted more natural light. While it doesn't rain all the time in Portland, it is overcast a lot. And, the tree to the south of the ADU was the biggest culprit in blocking natural light. It's sad to look out the window and see a gigantic, organic mass missing from the yard. On the other hand, seeing more sky is a pleasure. And indeed, with the tree now gone, the ADU does get more natural light. Meanwhile, the permeable pavers we laid along our pathway to the ADU needed some attention. 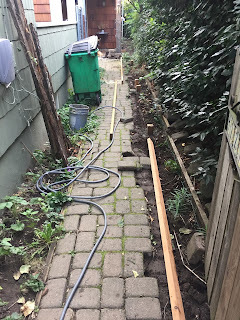 The pathway border edging I had used, composed of salvaged 2"x 8"cedar boards from an old deck I removed when clearing room for the ADU in 2011, had started to rot out. 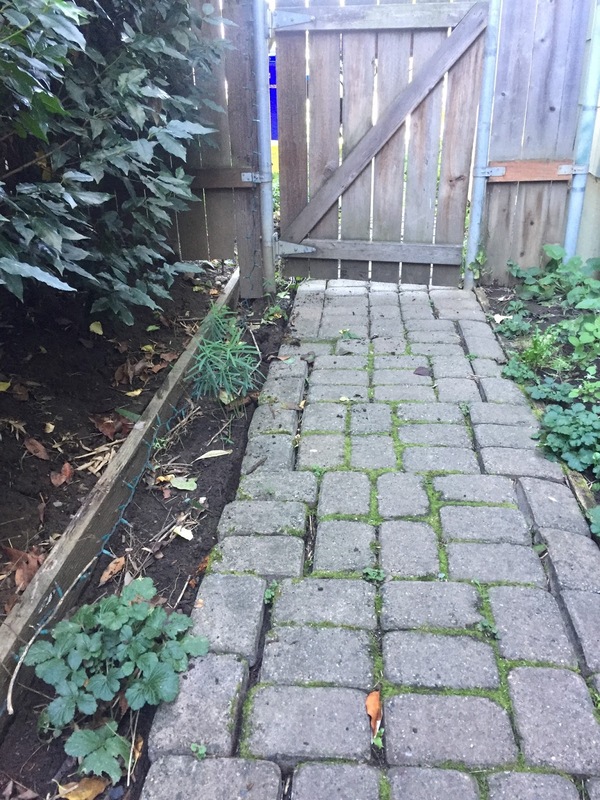 The pavers had begun to sprawl outwards, busting through the rotting wood, and creating many widening cracks. 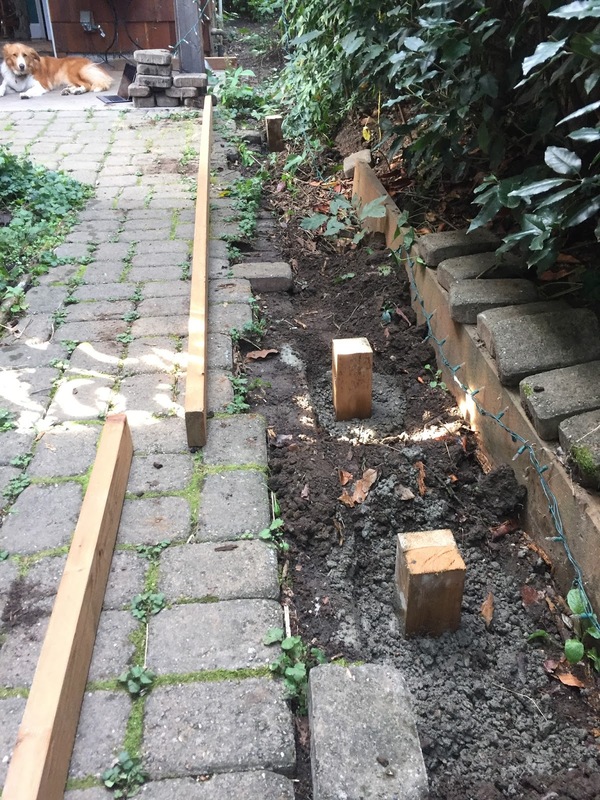 So, I removed the rotting borders, and replaced that wood with pressure treated wood, and braced the edging with 4x4 posts, anchored in concrete. I reveled the pavers and they're looking great again. 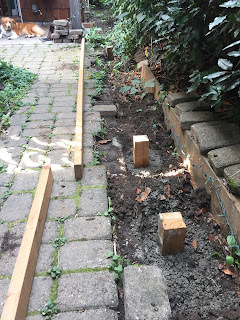 I figured that these two landscape updates, while somewhat mundane, were noteworthy enough that I'd post about them in my attempt to fully convey the details of ADU development. 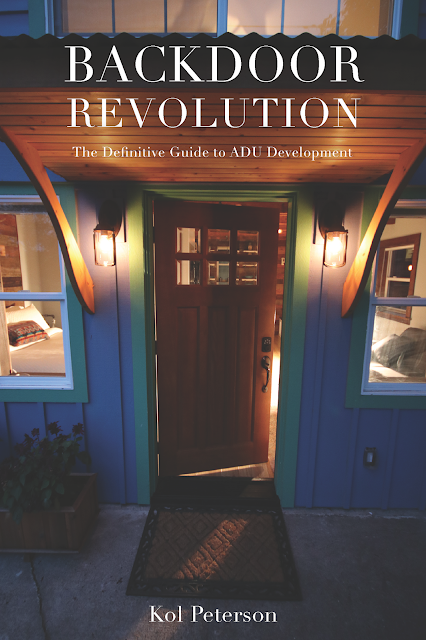 On a less mundane note, I'm proud to announce that I'm working on a book about ADU development. I've completed the first draft, in fact. It's been quite a process to write so far, and it's still a ways from being complete. But, when it's done, it's going to be good, noteworthy, and valuable to people who are interested in developing an ADU. It will also serve advocates, wonks, officials, and regulators who would like to understand the ins and out of municipal policy and regulations that dictate the potential of ADUs in a given jurisdiction. It will be the first book of its kind, focused on ADU development. I had heard that cedar shingles needed be restained every couple years. A couple months ago, I looked back and realized it's been four years since we finished building the ADU. Whoops. The stain had started to look tired; the siding needed a makeover. 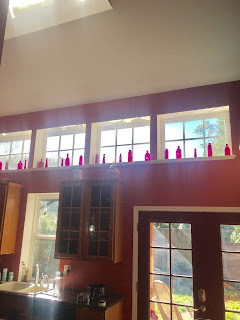 The shingles had lost some of their waterproofing capability and the portions of the structure that experience direct sunlight had started to visually deteriorate. Cedar shingle siding can last as little as 10 years if not maintained, and 40 years or more if it is. Here's a few ADU-related activities that I'm helping to head up this spring. Announcing the 2nd Build Small, Live Large, Build Small, Live Large: Portland’s Accessory Dwelling Unit Tour – Spring, 2015. The tour will be two days long this year, and will have twice as many ADUs as last year. The tour dates on Saturday, May 30th (NE Portland) and Sunday, May 31st, in SE Portland. I'll be teaching a Friday evening class on May 29th. Attendees can register to attend whichever portions interest them. It's very likely to sell out early, so if you're interested in attending, don't wait too long to purchase tickets. In case you can't make this one, note that we'll be running another ADU Tour in the fall of 2015, on November 7th, 2015. Earth Advantage is going to start an ADU designation this spring as an add-on to their Earth Advantage Broker designation. If you're a realtor who has taken one of my ADU classes, you'll be eligible to take an exam to receive the specialist accreditation. Earth Advantage will reach out to those who have taken one of the classes to notify them of this new add-on designation. On the class admin front, we're also going to start offering CCB credits for contractors who attend either of these classes. 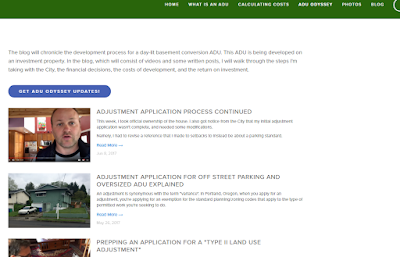 I've started an LLC dedicated to ADU related work called Accessory Dwelling Strategies, LLC. This company is designed to help others build ADUs. Along with the homeowner and realtor ADU classes, I also do on-site consultations with people who are interested in building an ADU on their property. The classes cover a huge amount of information which is intended to synthesize everything I wish I'd known before I started to plan for my ADU. The on-site consultations are useful for providing more customized feedback on-site. Many ADUs have a unique set of design criteria, site constraints, and financing models. The purpose of the individualized consultations is to distill an extensive amount of information about what has worked and why, and what doesn't work and why. Contact me through my Google profile page or email me at kolpeterson at yahoo dot com if you'd benefit from a one-on-one consultation. I also offer ongoing consultations throughout the ADU planning and design phase of the project for a fixed rate. See ADU Class page for more information. Starting this fall, I'm going to be teaching a new 4 hour ADU course designed for real estate professionals through the Earth Advantage Institute. If you know of realtors who may be interested in this class, please let them know about it. More information about the ADU course is available here. Recently permitted and completed ADUs in inner Portland. Homeowners who are willing to open their ADU to hundreds and hundreds of visitors. The hosts from the last tour said that hosting was one of the best experiences of their life. Many hosts compared the experience to their wedding day—no joke. The homeowner must be willing to have their ADU profiled on AccessoryDwellings.org. This profile involves sharing the design/build costs–so there’s a degree of transparency that is required by owners, in order to make the tour useful for attendees. Lastly, an article was published in Portland Business Journal that correctly differentiates ADUs from tiny houses on wheels. Oftentimes, media conflates these two building types when in fact, they are completely different from each other. Since I have my feet submerged in both ADUs and tiny houses on wheels, it was good to see an article that actually differentiated the two. Update 5/28/14: There's been a huge amount of interest in attending this tour, which is fantastic. Over 800 people have registered to attend. This blog focuses on the design/build process for my ADU. Occasionally, however, I make other ADU related announcements that will be of interest to readers. In this case, I'm very excited to announce Build Small, Live Large- Portland’s Accessory Dwelling Unit Tour. This will be the first tour of its kind, and promises to be a fantastic event. This ADU, ten other finished ADUs, and one under construction, will be featured on the tour. Homeowner, architects, and builders for the ADUs will be available to answer questions. There will also be a series of expert presentations held throughout the day. Additionally, attendees will be able to see eight tiny houses on wheels. The day will jam packed with small and tiny houses, networking opportunities, and access to ADU professionals and experts. If you're planning to build an ADU, this tour (and the ongoing ADU classes I offer) are the best ways to learn from others about the ADU designing, permitting, and building process. Here's the press release from Caravan- The Tiny House Hotel, about the tour. Throughout the day, attendees will also have the opportunity to tour four custom-built tiny houses on wheels at Caravan- The Tiny House Hotel. Caravan has received national media attention for being the first tiny house hotel in the United States. Caravan will host a late afternoon networking event from 4-6pm where attendees can meet local advocates, designers, builders and leaders of both the ADU and the tiny house movement. Real estate professionals can earn up to 6 CE credits. Attendees will have the opportunity to earn a special $25 discount to stay at Caravan, as well as enter a raffle for a free stay at Caravan.